Ramayana story: Hanuman and the pearl necklace of mother Sita! Then, Maa Sita removed a valuable necklace of pearls from her neck and offered it to the humble Sri Hanuman. Sri Hanuman received the necklace with great respect from Mata Sita, but began to break the pearls with His teeth. Sita, and other ministers who were sitting in the council-hall, were quite astonished at this queer act of Sri Hanuman. Some wondered why the noble and great warrior Sri Hanuman was behaving like a monkey. Was it the monkey mind? Sri Hanuman then tore his chest open with his mighty hands and Lo! Sri Rama and Maa Sita were seated in his heart! Lord Rama came down the throne and embraced Hanuman and blessed Him. He asked him, “Hanuman! What can I offer you on this occasion? I have no gift worthy to be given to you. 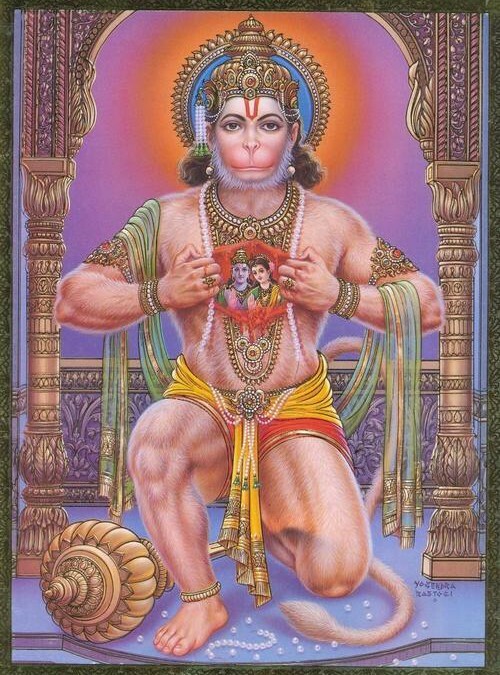 I am giving you myself as my gift to you.” Then, he offered his body to be clasped by Hanuman’s hands. The assembly was moved into shouts of “Jai ho” at this unique act of Grace. They praised Hanuman and declared that there was no one to equal him in all the worlds. They praised the devotion and dedication of Hanuman. When Sri Rama ascended to His Supreme abode, Hanuman also wished to follow Him. But the Lord asked him to remain in this world as His representative, and attend the assemblies of saints where discourses (katha) on His deeds were held and heard, and help His devotees in cultivating devotion. Hanumanji is a Chiranjeevi (immortal). He is everywhere. He who has devotion beholds Him, and receives His blessing.